Podcast: Where Does Our Fish Come From? Type:VideoLanguage:EnglishCategories:EducationStatus:On going Description： Five-part commissioned documentary series features how marine species and ecology being affected by human activities. 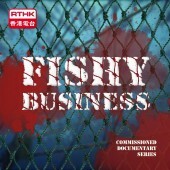 Produced by Monster Productions Ltd.
Because of the growing demand for live reef fishes and also the increasingly limited resources along our own coastline, traders from Hong Kong started to import reef fish from countries like Malaysia, Indonesia and Philippines etc in 1980s. The supply of reef fish even extended to Papua New Guinea, the Solomon Islands and Australia in 1990s; the main suppliers are from the ‘Coral Triangle’. The ‘Coral Triangle’ stretches across six countries in the western Pacific. The Coral Triangle’s marine ecosystem is plentiful but fragile; 120 million people rely on its resources to make a living. With a lack of effective fishery management and excessive demand from consumers, marine resources in this region are depleting quickly. Overfishing, adopting destructive fishing methods, such as using cyanide, and catching juvenile fish have affected not only the marine resources and biodiversity of the region, but also the livelihoods of fishermen and their families and communities who depend on the sea. Heru Pernomo is one of the major reef fish traders from Indonesia. Like other traders he used to adopt all kinds of measures to catch as many fish as he could to satisfy the market. However, in recent years, he has come to realize the consequences of overfishing and the negative effects of it, both on the reefs and on the fishing communities he works with. Five years ago, he met Yvonne Sadovy, Professor of Hong Kong University in Marine Biology, and learned about declining Humphead Wrasse and the damaging effects of cyanide on the reef. So he decided to stop selling Humphead Wrasse. He also decided to apply his own brand of fishery management such as not buying juvenile fish or fish caught with cyanide or dynamite, destructive fishing practices. Together with educating fishermen about the importance of the sea, he hopes to make sure that the marine resources for these communities are sustainably fished so that they will last long into the future.